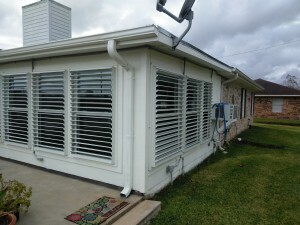 Aramco Outside Blinds have been a favorite, economical choice of home owners in Galveston County and surrounding areas for years. With an array of color options, custom manufacturing and baked on enamel finish, they provide durable protection while also beautifying your home. Mounted to the frame, these easily operated blinds have a hand turn knob that allows you to open and close the fully adjustable louvers to the degree of your choosing. Partially or fully closed, they block out the elements while providing protection. Completely open, you maintain protection and allow sunlight and airflow while enjoying the view. These blinds reduce electric or natural gas costs, help eliminate solar heat, reduce outside noise, are a theft deterrent, and allow for light and privacy control. Aramco Outside Blinds complement any home while providing weather protection, security, and energy savings for years to come. John’s Shutters & Repair to purchase Aramco Outside Blinds Inc.
2016: John’s Shutters & Repairs purchased Aramco Outside Blinds, including the machinery materials, website, phone number, and available parts. The traditional location on the island was not included but all material was relocated to the 10511 hwy 6, Hitchcock location. With the extensive product knowledge and man power the Aramco Outside Blinds product line is now available exclusively, at now John’s Shutters & Aramco LLC. 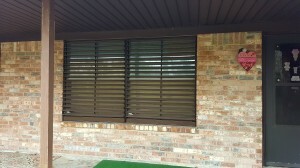 With a dealer network of several coastal dealers there is sure to be a way to become a proud owner of new shutters custom made for your application.